Denza! That name doesn’t sound particularly good, nor much imaginative to occidental ears, but this hardly matters since this new brand won’t sell its products anywhere but in China. The men behind the new brand have other plans for the rest of the world, and they have other assets too, considering the 2 companies behind the Denza brand name are no less than the Daimler group, owner of the Mercedes brand, the oldest car manufacturer in the world, and BYD, a relatively new company, but a leader in battery technology. 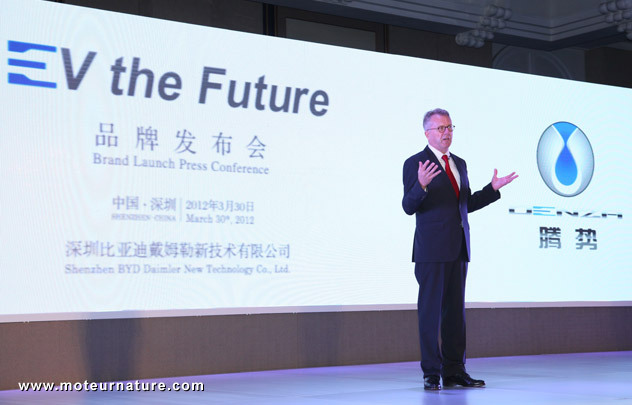 The Chinese and the German companies launched a joint-venture, BYD Daimler New Technology Co. Ltd. (BDNT), to build cars together 2 years ago. The first model will be unveiled at the Beijing motor show in April, but BDNT chose to unveil the brand name on a separate event. Smart move, so the people visiting the Beijing show know they will have to look for the Denza stand to see the new car. Poor name, it sounds like the name of a chewing gum. Will Daimler finally produce an EV version too ?